For other people named Daniel Pearl, see Daniel Pearl (disambiguation). Daniel Pearl (October 10, 1963 – February 1, 2002) was a journalist for The Wall Street Journal with American and Israeli citizenship. He was kidnapped and later beheaded by terrorists in Pakistan. Pearl was working as the South Asia Bureau Chief of The Wall Street Journal, based in Mumbai, India. He was kidnapped when he had gone to Pakistan as part of an investigation into the alleged links between British citizen Richard Reid (known as the "shoe bomber") and Al-Qaeda. Pearl was killed by his captors. In July 2002, Ahmed Omar Saeed Sheikh, a British national of Pakistani origin, was sentenced to death by hanging for Pearl's abduction and murder. In March 2007, at a closed military hearing in Guantánamo Bay, Khalid Sheikh Mohammed, a member of Al-Qaeda, claimed that he had personally beheaded Pearl. Researchers have also connected Al-Qaeda member Saif al-Adel with the kidnapping. The Daniel Pearl Foundation was formed in 2002 in memory of Pearl, to promote the ideals that inspired his life and work. The Foundation works domestically and internationally to promote cross-cultural dialogue and understanding, to counter cultural and religious intolerance, to cultivate responsible and balanced journalism and to inspire unity and friendship through music. Pearl was born in Princeton, New Jersey to Ruth (née Rejwan) and Judea Pearl. His mother is a Iraqi Jew whose family was saved from the Farhud by Muslim neighbors and his father is an Israeli of Polish-Jewish descent. His family moved to the Encino district of Los Angeles, when his father took a position with UCLA. His father, Judea Pearl, is a professor of computer science and statistics, and director of the Cognitive Systems Laboratory at UCLA. He has received the Turing Award. The history of the family and its connections to Israel are described by Judea Pearl in the LA Times article, "Roots in the Holy Land". Pearl attended Portola Junior High School and Birmingham High School. Danny, as he was known throughout his life, attended Stanford University from 1981 to 1985, where he stood out as a Communication major with Phi Beta Kappa honors, a member of the Alpha Delta Phi Society, a co-founder of a student newspaper called the Stanford Commentator, as well as a reporter for the campus radio station KZSU. Pearl graduated from Stanford with a B.A. in Communication, after which he spent a summer as a Pulliam Fellow intern at The Indianapolis Star. Following a trip to the Soviet Union, China, and Europe, Pearl started his professional journalism career at the North Adams Transcript and The Berkshire Eagle in western Massachusetts. From there he moved to the San Francisco Business Times. In 1990 Pearl moved to the Atlanta bureau of the Wall Street Journal, and moved again in 1993 to its Washington, D.C., bureau to cover telecommunications. In 1996 he was assigned to the London bureau and in 1999 to Paris. His articles covered a range of topics, such as the October 1994 story of a Stradivarius violin allegedly found on a highway on-ramp, and a June 2000 story about Iranian pop music. He became more involved in international affairs: his most notable investigations covered the ethnic wars in the Balkans, where he discovered that charges of an alleged genocide committed in Kosovo were unsubstantiated. He also explored the American missile attack on a supposed military facility in Khartoum, which he proved to have been a pharmaceutical factory. In 1999 in Paris, Pearl met and married French journalist Mariane van Neyenhoff, a former reporter and columnist for Glamour. their son, Adam Daniel Pearl, was born in Paris on May 28, 2002, approximately four months after Pearl's death. 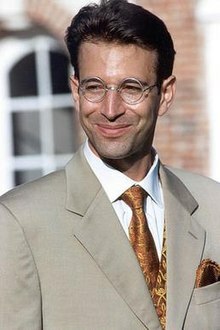 The Pearls settled in Mumbai, India after Daniel Pearl was made Southeast Asia bureau chief of The Wall Street Journal. They traveled to Karachi, Pakistan, which he used as a base for reporting on the United States' War on Terrorism following the 9/11 attacks by Al-Qaeda terrorists in 2001 in the United States. On January 23, 2002, on his way to what he thought was an interview with Sheikh Mubarak Ali Gilani at the Village Restaurant in downtown Karachi, Pearl was kidnapped near the Metropole Hotel at 7:00 p.m. by a militant group calling itself the National Movement for the Restoration of Pakistani Sovereignty. The group claimed Pearl was a spy and—using a Hotmail e-mail address—sent the United States a range of demands, including the freeing of all Pakistani terror detainees, and the release of a halted U.S. shipment of F-16 fighter jets to the Pakistani government. Photos of Pearl handcuffed with a gun at his head and holding up a newspaper were attached. The group did not respond to public pleas for release of the journalist by his editor and his wife Mariane. United States and Pakistani intelligence forces tried to track down the kidnappers. Nine days later, the terrorists beheaded Pearl. On May 16, his severed head and decomposed body were found cut into ten pieces, and buried, along with an identifying jacket, in a shallow grave at Gadap, about 30 miles (48 km) north of Karachi. When the police found Pearl's remains, Abdul Sattar Edhi, a Pakistani philanthropist, collected all of the body parts and took them to the morgue. He helped ensure that Pearl's remains were returned to the United States, where he was later interred in the Mount Sinai Memorial Park Cemetery in Los Angeles. On February 21, 2002, a video was released titled The Slaughter of the Spy-Journalist, the Jew Daniel Pearl. The video shows Pearl's mutilated body, and lasts 3 minutes and 36 seconds. My name is Daniel Pearl. I'm a Jewish American from Encino, California, USA. I come from, uh, on my father's side the family is Zionist. My father's Jewish, my mother's Jewish, I'm Jewish. My family follows Judaism. We've made numerous family visits to Israel. Pearl condemned American foreign policy in the video. His family stated that he did so under duress, describing him as "a proud American, and he abhorred extremist ideologies." They also said that he gave signals that indicated that he did not agree with what he was saying. Following these statements, Pearl's throat was slit, and his head was severed. The video concluded with the captors demanding the release of all Muslim prisoners in Guantanamo Bay. They warned that, if their demands were not met, they would repeat such a beheading "again and again." Three suspects were caught by February 6, 2002, after the IP address of those who sent the ransom e-mail was traced by police in Karachi. The arrests were carried out after investigation by Pakistani detective Mir Zubair Mahmood, assisted by an FBI computer expert. The mastermind of the kidnapping, Ahmed Omar Saeed Sheikh, surrendered to a former ISI officer, Brig. Ijaz Shah, who concealed Sheikh's whereabouts from the Karachi police for a week. Sheikh had been in an Indian prison in connection with 1994 Kidnappings of Western tourists in India. In December 1999 he was released by the Indian government in exchange for the safe release of passengers aboard hijacked Indian Airlines Flight 814. On March 21, 2002, in Pakistan, Ahmed Omar Saeed Sheikh and three other suspects were charged with murder for their part in the kidnapping and murder of Daniel Pearl. They were convicted on July 15, 2002, and Sheikh was sentenced to death. Sheikh has appealed the sentence. Hearings in his case have been postponed numerous times, and no definitive date has been set for his execution. In his book In the Line of Fire, President of Pakistan Pervez Musharraf stated that Sheikh may have been an agent of MI6, and at some point may have become a double agent. On March 10, 2007, Khalid Sheikh Mohammed claimed responsibility, before his Combatant Status Review Tribunal at Guantanamo Bay, for the murder of Daniel Pearl. He is an alleged Al Qaeda operative reported to be third in command under Osama bin Laden, mastermind of the 2001 attacks. He claimed to have beheaded Pearl. In a confession read during his Tribunal hearing, Khalid Sheikh Mohammed said, "I decapitated with my blessed right hand the head of the American Jew Daniel Pearl, in the city of Karachi, Pakistan." This confession repeated word for word the phrasing leaked in 2002 from his interrogation at a CIA black site interrogation center. On March 19, 2007, Ahmed Omar Saeed Sheikh's lawyers cited Khalid Sheikh Mohammed's confession as part of an appeal in defense of their client. They said they had always acknowledged that their client played a role in Pearl's murder, but they had argued that Khalid Sheikh Mohammed was the actual murderer. They plan to feature Mohammed's confession as central in their appeal of their client's death sentence. According to an investigative report published in January 2011 by Georgetown University, the Federal Bureau of Investigation used vein matching to determine that the perpetrator in the video of the killing of Pearl was most likely Mohammed, identifying him through a "bulging vein" running across his hand that was visible in the video. Federal officials had been concerned that Mohammed's confession obtained through waterboarding would not hold up in court. They intended to use this forensic evidence to bolster their case that he had murdered Pearl. A Pakistani official announced on March 19, 2013, that another suspect was captured in connection with Pearl's murder and was in police custody. Pakistan's Inter Services Public Relations Directorate confirmed the arrest by a paramilitary unit known as the Pakistan Rangers. A collection of Pearl's writings (At Home in the World) was published posthumously in 2002. The Wall Street Journal noted that these demonstrated his "extraordinary skill as a writer" and his "eye for quirky stories—many of which appeared in The Wall Street Journal's "middle column". The Daniel Pearl Foundation was formed by Pearl's parents Ruth and Judea Pearl; other family and friends have joined to continue Pearl's mission. They intend to carry out the work in the spirit, style, and principles that shaped Pearl's work and character. Daniel Pearl World Music Days has been held worldwide since 2002, and has promoted over 1,500 concerts in over 60 countries. Pearl's widow, Mariane Pearl, wrote the memoir A Mighty Heart, which tells the full story of Pearl and more about his life. The book was adapted into a film starring Dan Futterman as Daniel Pearl, Angelina Jolie as Mariane Pearl, Irfan Khan, Adnan Siddiqui, Archie Panjabi, and Will Patton. On September 1, 2003, a book titled Who Killed Daniel Pearl? was published, written by Bernard-Henri Lévy. The book, which the author characterized as an "investigative novel", stirred controversy for some of its speculative conclusions about the killing, for some of its characterizations of Pakistan, and for the author's decision to engage in an exercise of fictionalizing Pearl's thoughts in the final moments of his life. Lévy was criticized for the book. This book is being adapted into a film directed by Tod Williams and starring Josh Lucas, focusing on the last few days of Daniel Pearl's life. HBO Films produced a 79-minute documentary titled The Journalist and the Jihadi: The Murder of Daniel Pearl. It premiered on HBO on October 10, 2006. The documentary chronicles Pearl's life and death, and features extensive interviews with his immediate family. It is narrated by Christiane Amanpour, and was nominated for two Emmy Awards. Pearl's parents edited and published a collection of responses sent to them from around the globe, entitled I Am Jewish: Personal Reflections Inspired by the Last Words of Daniel Pearl (Jewish Lights Publishing, 2004). At one point on the video, Pearl said: "My father is Jewish, my mother is Jewish, I am Jewish," after which Pearl added one obscure detail, that a street in Israel's Bnei Brak is named after his great grandfather, who was one of the founders of the town. The family has written that it understands this last detail authenticates Daniel's own voice and demonstrates his willingness to claim his identity. Judea Pearl has written that at first this statement surprised him, but he later understood it to be a reference to the town-building tradition of his family contrasted with the destructive aims of his captors. Judea Pearl then enlarged the idea by inviting responses from artists, government leaders, authors, journalists, scientists, scholars, rabbis, and others. All wrote personal responses to what they thought upon hearing that these were Pearl's last words. Some responses were one sentence while others were several pages. The book is organized by five themes: Identity; Heritage; Covenant, Chosenness, and Faith; Humanity and Ethnicity; Tikkun Olam (Repairing the World) and Justice. Contributors include Theodore Bikel, Alan Dershowitz, Kirk Douglas, Ruth Bader Ginsburg, Larry King, Amos Oz, Shimon Peres, Daniel Schorr, Elie Wiesel, Peter Yarrow, and A.B. Yehoshua. In 2002, Pearl posthumously received the Elijah Parish Lovejoy Award from Colby College and in 2007, the Lyndon Baines Johnson Moral Courage Award from the Houston Holocaust Museum. American minimalist composer Steve Reich wrote his 2006 work Daniel Variations, jointly commissioned by the Daniel Pearl Foundation and the Barbican Centre, which interweaves Pearl's own words with verses from the Book of Daniel. On April 16, 2007, Pearl was added to the Holocaust Memorial on Miami Beach as the first non-Holocaust victim. His father gave his consent for the induction in order to remind generations to come that "The forces of barbarity and evil are still active in our world. The Holocaust didn't finish in 1945." Journalist Bradley Burston criticized the addition of a post-Holocaust victim to the memorial, saying "it diminishes the uniqueness of the Holocaust". On December 10, 2007, President George W. Bush and Laura Bush invited Ruth and Judea Pearl, parents of Daniel Pearl, to the White House Chanukah reception. They lighted the Pearl family menorah that once belonged to Daniel's great-grandparents, Chaim and Rosa Pearl, who brought it with them when they moved from Poland to Israel in 1924. There they helped establish the town of Bnai-Brak. The late former mayor of New York City Ed Koch requested that his own tombstone be inscribed with Pearl's words: "My father is Jewish, my mother is Jewish, I am Jewish." Shortly after Pearl's death, his parents founded the Daniel Pearl Foundation. The foundation's mission is to promote cross-cultural understanding through journalism, music, and dialogue. The honorary board of the Daniel Pearl Foundation includes Christiane Amanpour, former US President Bill Clinton, Abdul Sattar Edhi, John L. Hennessy, Ted Koppel, Queen Noor of Jordan, Sari Nusseibeh, Mariane Pearl, Itzhak Perlman, and Elie Wiesel. The Daniel Pearl Memorial Lecture at UCLA was established by the foundation in 2002. Christopher Hitchens delivered a lecture on March 3, 2010. Other lecturers have included Anderson Cooper, David Brooks, Ted Koppel, Larry King, Jeff Greenfield, Daniel Schorr, and Thomas Friedman. Soka University of America's student news magazine, titled the Pearl, is named in honor of Daniel Pearl. On May 19, 2010, U.S. President Barack Obama signed the Daniel Pearl Freedom of the Press Act, which protects U.S. journalists around the world. The act is also designed to use tools from the Secretary of State to ensure that freedom of press is upheld in other countries. In 2010, Moment established The Daniel Pearl Investigative Journalism Initiative (DPIJI) to provide grants and mentors for independent journalists to conduct in-depth reporting on anti-Semitism and other prejudices. The edited stories are published in Moment. The project has already produced two stories that have been nominated for the prestigious Livingston Award—the equivalent of the Pulitzer for journalists under 35. The Sammy Ofer School of Communications at IDC Herzliya introduced the Daniel Pearl International Journalism Institute, a new partnership between IDC Herzliya and the Daniel Pearl Foundation. The multimedia newsroom at the School of Communications was named in honor of Daniel Pearl. In 2005, The Wall Street Journal, in conjunction with the École de Journalisme de Sciences Po, gave the first Daniel Pearl Prize to Louis-Étienne Vigneault-Dubois from Canada, at a ceremony held on June 10 in Paris. Since 2003, Stanford's Department of Communication has awarded a paid summer internship with The Wall Street Journal, known as the "Daniel Pearl Journalism Internship." In 2008 the International Consortium of Investigative Journalists' bi-annual ICIJ awards were renamed the Daniel Pearl Awards for Outstanding International Investigative Reporting. The Samuel Eells Literary and Educational Foundation annually awards the Brother Daniel Pearl Stanford 85' Award for Literary Excellence to one undergraduate member of the Alpha Delta Phi Society or Fraternity who has displayed exceptional skill and enthusiasm in fiction, non-fiction, poetry, music and lyrics, photography, or film. In East Brunswick Township, Temple B'nai Shalom renamed their Hebrew School 'The Daniel Pearl Education Center' after Pearl. Additionally, the Synagogue has created a "Daniel Pearl Education Scholarship". ^ a b "Online NewsHour Update: Pakistan Convicts Four Men in Pearl Murder". PBS.org. 2002-07-15. Retrieved 2013-09-26. ^ a b Mount, Mike (15 March 2007). "Khalid Sheikh Mohammed: I beheaded American reporter". CCN.com. Cable News Network. Retrieved 24 March 2013. ^ a b Anthony, Augustine (2011-05-23). "Study ties new al Qaeda chief to murder of journalist Pearl". Reuters. Retrieved 2013-02-04. ^ Fonda, Daren (27 September 2003). "On the Trail of Daniel Pearl". Time.com. Time, Inc. Retrieved 24 March 2013. ^ Escobar, Pepe (28 June 2003). "Book Review: Who Killed Daniel Pearl?". Asia Times Online. Asia Times Online Co, Ltd. Retrieved 24 March 2013. ^ "Profile: Omar Saeed Sheikh". BBC News. July 16, 2002. Retrieved April 30, 2010. ^ "Al-Qaida No. 3 says he planned 9/11, other plots". MSNBC. Associated Press. 2007-03-15. Retrieved 2013-02-04. ^ Katherine Shrader (2007-03-15). "9/11 Mastermind Admits Killing Reporter". Houston Chronicle. Archived from the original on 2007-03-17. Retrieved 2007-03-20. ^ "Daniel Pearl Foundation". Daniel Pearl. 2011-05-23. ^ UCLA Cognitive Systems Laboratory (Experimental) Index: Judea Pearl - Home Access date: February 12, 2010. ^ Pearl, Judea, "Roots in the Holy Land", Los Angeles Times, 16 May 2008. ^ Pearl, Daniel (2002-06-24). At Home in the World: Collected Writings from The Wall Street Journal. Simon and Schuster. p. 17. ISBN 9780743244152. Retrieved 25 February 2014. ^ "Daniel Pearl Biography and Writings". The Pearl Project. Georgetown University. Retrieved January 19, 2019. ^ Pearl, Daniel. "Stradivarius Violin, Lost Years Ago, Resurfaces but New Owner Plays Coy". The Wall Street Journal Archive: October 17, 1994. ^ Pearl, Daniel; Block, Robert (31 December 1999). "Despite Tales, the War in Kosovo Was Savage, but Wasn't Genocide" – via www.wsj.com. ^ Jackson, Harold (February 23, 2002). "Obituary: Daniel Pearl". The Guardian. ISSN 0261-3077. Retrieved January 19, 2019. ^ "Jim Lehrer interviews Mariane Pearl, the wife of murdered Wall Street Journal reporter Daniel Pearl". The NewsHour with Jim Lehrer. 18 March 2002. Retrieved 2007-06-19. ^ "Pearl's widow gives birth to their son Adam Daniel Pearl". CNN. 30 May 2002. Retrieved 2007-06-19. ^ Musharraf, Pervez (2006-09-26). In the Line of Fire: A Memoir. Simon and Schuster. p. 226. ISBN 9780743298438. Retrieved 25 February 2014. ^ Pellegrini, Frank (2002-02-21). "Daniel Pearl: 1963–2002". Time Magazine. ^ Rory McCarthy (2002-05-18). "Body parts believed to be of murdered US reporter; Clues found in nearby hut are linked to Daniel Pearl". Guardian. London. Retrieved 2013-09-26. ^ Lee, Henry C.; Tirnady, Frank. Blood Evidence: How Dna Is Revolutionizing the Way We Solve Crimes. Perseus Pub. p. 304. ISBN 9780738206028. Retrieved 25 February 2014. ^ Green, David B. (1 February 2015). "Journalist Daniel Pearl Murdered in Pakistan by Islamic Terrorists". Haaretz. Retrieved 10 October 2018. ^ Reuters (19 March 2013). "Suspect arrested in Pakistan for murder of US journalist". Mail & Guardian. Retrieved 10 October 2018. ^ a b Pearl, Judea; Pearl, Ruth (May 14, 2008). "Right of Reply: Daniel Pearl's last words". The Jerusalem Post. Retrieved October 22, 2012. ^ Rosenbaum, Ron (2004). Those Who Forget the Past: The Question of Anti-Semitism. Random House Digital, Inc. pp. xxiv. ISBN 0-8129-7203-1. ^ Sylvan Barnet; Hugo Bedau (2012). Critical Thinking, Reading, and Writing: A Brief Guide to Argument. Macmillan. p. 144. ISBN 0-312-60160-3. ^ McCarthy, Rory. "Pakistan holds three as net closes on US reporter's kidnappers". The Guardian February 6, 2002. ^ "President dubs alleged Pearl killer MI6 spy". Gulf Times. 2006-09-26. Archived from the original on 2007-03-22. Retrieved 2007-03-20. ^ "Al-Qaeda suspect says he beheaded Pearl". Mail & Guardian. 16 March 2007. Retrieved 10 October 2018. ^ "Verbatim Transcript of Combatant Status Review Tribunal Hearing for ISN 10024 (ie. Khalid Sheikh Mohammed)" (PDF). US Department of Defense. 2007-03-10. Retrieved 2007-03-10. ^ "Daniel Pearl". The Herald (Glasgow). 2002-02-25. p. 14. ^ "Pearl murder convict to appeal after confession". Reuters. 2007-03-19. Archived from the original on 2007-04-02. Retrieved 2007-03-19. ^ Ackerman, Spencer (January 20, 2011). "Qaeda Killer's Veins Implicate Him In Journo's Murder". Wired. Retrieved January 21, 2011. ^ Blackburn, Bradley (January 20, 2011). "Report Says Justice Not Served in Murder of Daniel Pearl, Wall Street Journal Reporter". ABC News. Retrieved January 20, 2011. ^ "Pakistan captures suspect in death of journalist Daniel Pearl, official says". NBC News. Retrieved 19 March 2013. ^ Pearl, Daniel. At Home in the World: Collected Writings from the Wall Street Journal[permanent dead link]. New York: Free Press, June 2002. ISBN 0-7432-4317-X. ^ "Daniel Pearl Foundation". Daniel Pearl Foundation. Retrieved 2007-03-20. ^ "danielpearlmusicdays.org". danielpearlmusicdays.org. 2011-08-18. Retrieved 2013-09-26. ^ Pearl, Mariane, and Sarah Crichton. A Mighty Heart. New York: Scribner, 2003. ISBN 0-7432-4442-7. Access date: 2007-03-20. ^ with appearances by Alyy Khan and Zafar Karachiwala Moerk, Christian (2005-07-31). "The Race To Put Pearl On Screen". The New York Times. Archived from the original on 2007-03-11. Retrieved 2007-03-20. ^ Lévy, Bernard Henri (2003-09-01). Who Killed Daniel Pearl?. Melville House Pub. ISBN 9780971865945. Retrieved 25 February 2014. ^ Lévy, Bernard-Henri (2003). Who Killed Daniel Pearl?. Melville House Publishing. ISBN 0-9718659-4-9. ^ Escobar, Pepe. "Who Killed Daniel Pearl?". Asia Times. Retrieved 2007-03-20. ^ Dalrymple, William (2003-12-04). "Murder in Karachi". New York Review of Books. Retrieved 2007-03-20. ^ Lévy, Bernard-Henri and William Dalrymple (2004-02-12). "Murder in Karachi: An Exchange". New York Review of Books. Retrieved 2007-03-20. ^ Lévy, Bernard-Henri (2003-10-23). "Who Killed Daniel Pearl?". BBC. Retrieved 2007-03-20. ^ "Zwick to Make Film About Daniel Pearl". Rotten Tomatoes. 2005-02-22. Retrieved 2007-03-20. ^ "Closed for Maintenance". Jewish Lights. Retrieved 2013-09-26. ^ Pearl, Ruth & Judea, eds. I Am Jewish: Personal Reflections Inspired by the Last Words of Daniel Pearl. Jewish Lights Pub., January 2004. ISBN 1-58023-183-7. ^ Burston, Bradley. "Holocaust denial begins at home". Haaretz April 17, 2007. ^ "Chanukah in the White House with the Pearl Family". YouTube. 2007-12-12. Retrieved 2013-09-26. ^ "Ed Koch Dead: Mayor Who Became A Symbol Of NYC Dies At 88 (PHOTOS)". The Huffington Post. February 1, 2013. Retrieved 2013-03-28. ^ "Daniel Pearl International Journalism Institute". Portal.idc.ac.il. 2013-04-17. Retrieved 2013-09-26. ^ "WSJ and Sciences Po Journalism School Award 1st Daniel Pearl Prize to Louis-Étienne Vigneault-Dubois". Danielpearl.org. 2005-06-14. Archived from the original on 2013-09-28. Retrieved 2013-09-26. Popham, Peter (2002-02-23). "Video Reveals the Hideous Sacrifice of Captive Reporter; Pearl murder gruesome tape shows American speaking into camera as unknown killer slits his throat, then beheads him". The Independent. Newspaper Publishing PLC. p. 2. Pearl, Ruth and Judea, eds. I Am Jewish: Personal Reflections Inspired by the Last Words of Daniel Pearl. Jewish Lights Pub., January 2004. ISBN 1-58023-183-7. Introduction of the "Daniel Pearl Freedom of the Press Act of 2009"
Wikimedia Commons has media related to Daniel Pearl. "Daniel Pearl". Find a Grave. Retrieved 2015-12-20.